I find it odd that Bob Tisdale doesn't know that there are currents and upwelling and all sorts of movement of water in the world's oceans. He's written before about how he rejects the fact that oceans have currents that run deep and long. The reason it is strange is that Bob regards himself as WUWT's resident expert on oceans. Yet he doesn't understand what is surely fundamental to an understanding of oceans - and how they influence climate. He wrote an article with a wrong headline: "Ocean ‘Global Warming’ is not actually ‘global’ at all". Well, I don't know quite what he means by Ocean 'Global Warming' - the term global warming is normally applied to the globe - the land and the oceans and the atmosphere. Still, if he thinks that the oceans aren't warming he's very wrong. He even puts up charts that show they are warming. Alarmists are having a grand time trying to scare their readers with their chicken-little end-is-near proclamations. Example: see the post titled “The oceans are warming so fast, they keep breaking scientists’ charts” at SkepticalScience here and The Guardian here. Also see Joe Romm’s post ‘Hottest Year’ Story Obscures Bigger News: Ocean Warming Now Off The Charts at ClimateProgress. Down to 2000 m the oceans have broken the 20 x 1022 Joules barrier. 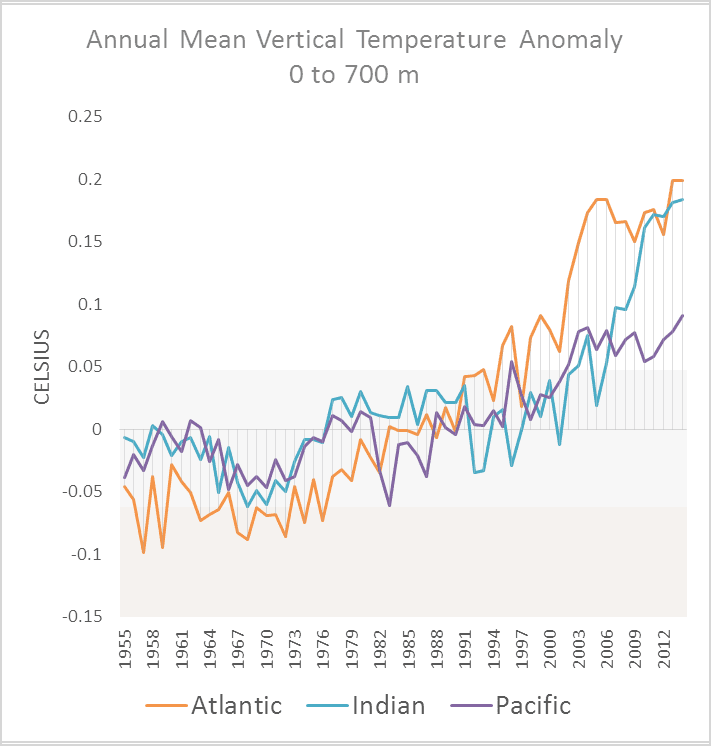 Of course, the alarmists present the ocean heat content data, not the vertically averaged temperature data. Why? 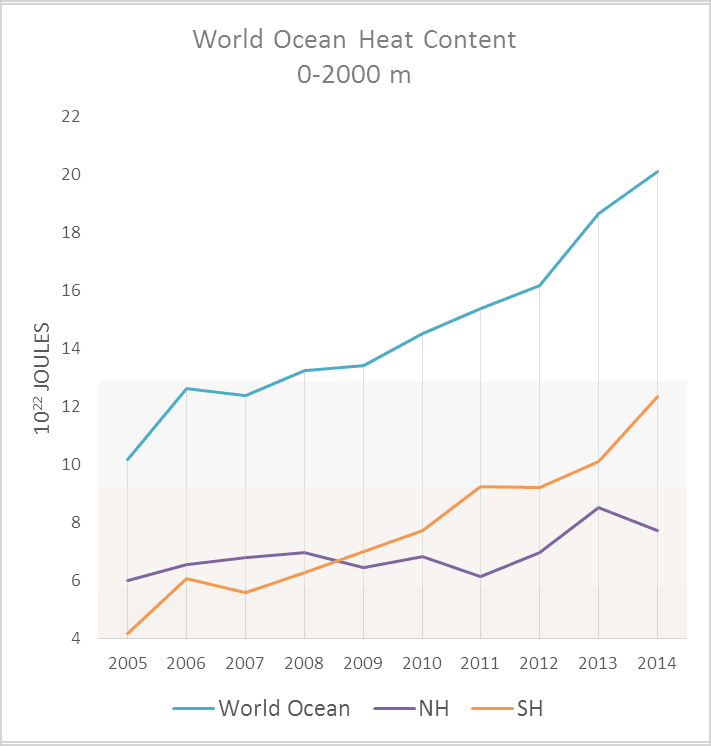 The oceans have an extremely large heat capacity, so a very slight increase in the temperature of the oceans to depths of 2000 meters represents a very large uptake of heat when placed in terms of 10^22 Joules…the units used by the NODC. So to counter the alarmists, we present the NODC data in terms of deg C (data here), because people are more familiar with temperature. We also break the data down into basins and subsets to show that the warming rates are not uniform, which is tough to explain with greenhouse gas-driven human-induced global warming. So here’s a general introductory discussion of that NODC temperature data to depths of 2000 meters. Bob pretends that he's only using temperature because deniers are too dumb to understand joules. Some of them probably are, but quite a few deniers, you may be surprised to know, did study a bit of science at school and have heard of joules before. You'll also have seen what I meant when I wrote that Bob rejects the fact that the oceans are not static pools of water. Nor does he seem to be aware that the air above them has a tendency to blow about a bit too. He thinks that greenhouse warming means that the oceans should all warm evenly and to depth. He's probably never heard of terms like thermohaline circulation. He might not be aware that the water in the ocean can move sideways and up and down. Nor that an awful lot of energy is being stored when you see the oceans are warming way down to two kilometers deep. Bob's article is very short by Bob's standards. That could be because he's written almost identical articles before. He only put up one chart of vertical mean temperature to 2000m and a great big pie chart. I did some charts too, if you're interested. I don't know what he did with his anomalies. They aren't those reported by NODC. He screwed it up somehow. He seems to have aligned them all at zero for 2003, almost. If you look at the chart I did for 0-2000m you'll see he got that wrong. Nor can I fathom why Bob Tisdale would be so sanguine about this. The oceans really are getting a lot hotter and this has to have an impact on the land, where most of us live. Just what that impact will be I don't know, but I expect that it will continue to get hotter. Precipitation will change - maybe more intense downpours and maybe shifts in rainfall patterns. Another thing I noticed is that Bob Tisdale restricted his charts to the period since 2003 and said how the North Atlantic and Pacific haven't warmed much in the last 12 years. It's true. They haven't. But look at the Atlantic overall. And see the chart below for what happened in the North Atlantic in the period just beforehand. If you look at the 2000 m chart above, it's the Pacific Ocean that's hasn't heated up quite as quickly lately, not the Atlantic so much. 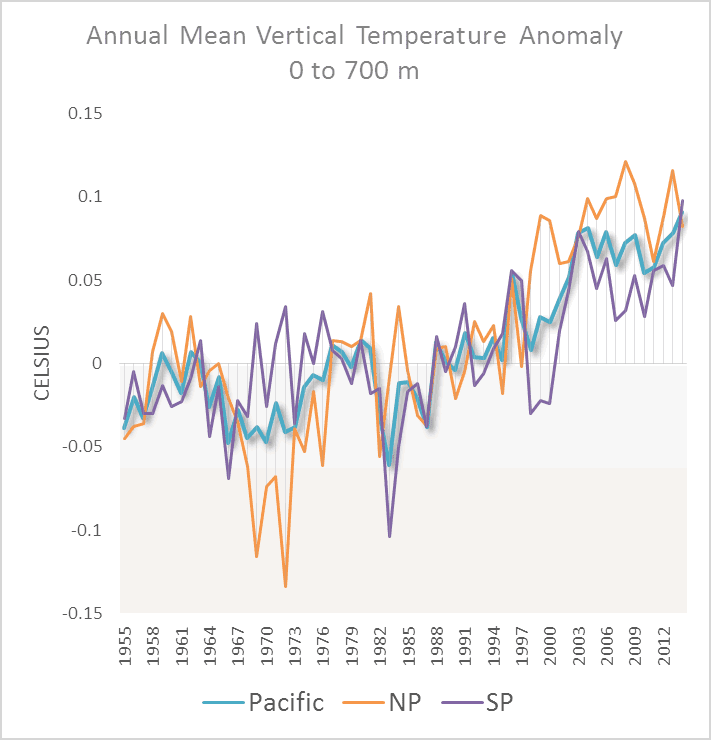 However the South Pacific has got warmer recently catching up to the North Pacific. 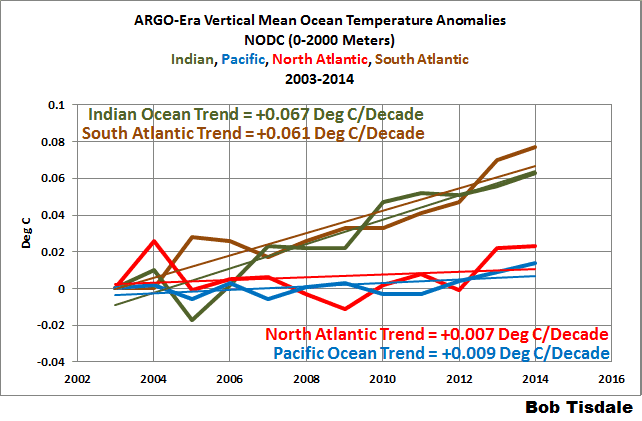 So despite what Bob Tisdale will have his readers believe, all the oceans are warming. And taking them altogether the oceans are warming up a helluva lot. The Argo temperature profiles are accurate to +/-0.002°C, according to the FAQ. Nick Stokes explains why heat content is the more commonly used measure. There was a long debate about whether or not infrared radiation can heat water, with mpainter arguing it couldn't. 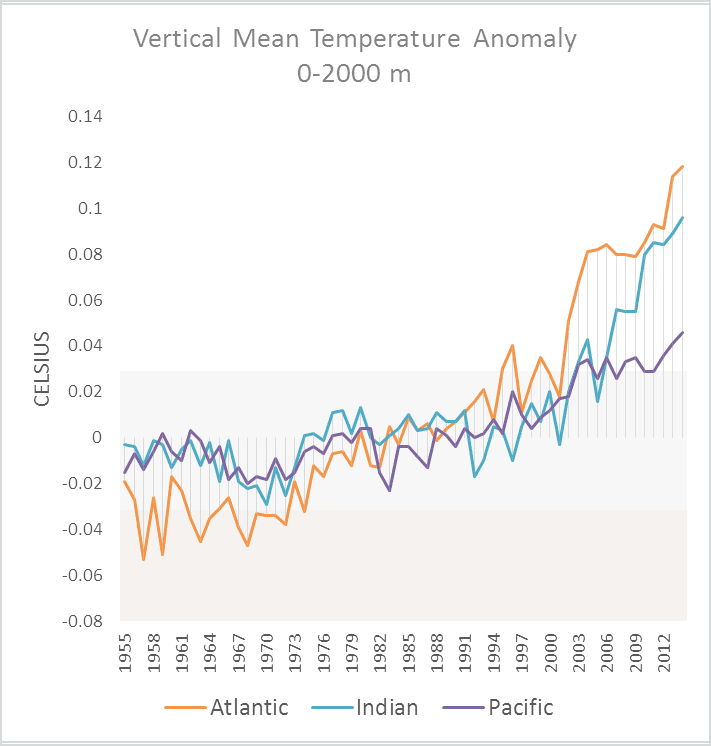 There was no discussion of what is causing the the oceans are heating up if not for the increased IR, except for one rather silly person - emsnews who seems to think the deep cold ocean is hotter than the surface. Weird. So it has zero to do with CO2..
First, there is no absence of warming to 2000 m. There's already been a lot of warming to depth. Secondly, the fact that the oceans aren't still and static is exactly why you'll see different warming in different parts of the ocean. Bob isn't just ignorant, he's dense. Which is a good note to end on. Every denier site has the world's expert on at least some aspect of climate who is without a doubt more knowledgeable than everyone else in the world on the subject. Their audience will assure you of this. lets keep the list going shall we? Matt Ridley, DPhil (pheasant mating) and banker extraordinaire. Q: But you were wrong? MR: We were hit by an unexpected and unpredictable concatenation of events. Oh yes. "Middle of the road" Matt. Bob's misunderstanding of how the oceans work reminds me of Goddard's ignorance of how freshwater lakes work (he never heard of the term "limnology" before). He wrote an article on why Lake Superior was so cold. He didn't understand that Superior turns over, didn't know about the epiliminon, didn't know about the thermocline, etc. It was an embarrassing piece even by his standards---I notice that his piece has now been chopped down to remove evidence of his ignorance (it was still intact about six months after originally posting so I assume he'd been doing his own digging for answers instead of relying on the hordes of folks who told he exactly where he'd gone wrong). Grumbine Science had a bit of a take down to his original post. I see that in a different post, Bob demonstrates that he knows how to use the verb "admit" in a misleading way just like David Rose.does. I don't understand the science, but I can recognize a bad faith argument when it is that blatant. "Dana Nuccitelli has finally admitted something we’ve been discussing for more than 6 years [...] he admitted that during a decade-long (or multidecadal) period(s) when El Niño events dominate (when El Niños are stronger, last longer and happen more frequently), the El Niños enhance global warming, and during periods when La Niña events dominate (when there are weaker, shorter and fewer El Niño events), the absence of El Niño events suppresses the warming of global surfaces." Where in the hell is Tisdale's head? He's just gone and scored an own goal with this one and neither he nor the WUTTers seem to realize it. rooter seems to be on it: "Perhaps Tisdale could define what 'long-term' is?" Three times Bob avoided my direct questions about what other SST products show vs. CMIP5 in the absolute. And of course he and his merry band "missed" the point that this is why we do properly baselined anomalies, not absolute temps, in general ... but especially for model comparisons to measured estimates of reality. And how does that hot atmospheric air warm the oceans in the first place? 105 F air in Phoenix doesn’t warm that swimming pool especially enough to counter the massive latent heat of evaporation. It’s the water vapor cycle, clouds, precipitation and ocean floor geothermal heat flux that heat/cool the oceans and power the climate. CO2/GHGs are nothing but bee farts in a hurricane." It amazes me that these people who, until very recently, argue "It's the sun" to explain any warming can't see that it really is the sun when it matters. When the sun's radiation hits the surface of land, that's exactly what it does. Hit the surface. Any warming has to happen right there on the top and only gets to (very limited) depth by conduction. When the sun's radiation hits the surface of the ocean it just keeps right on going. That's why people can go diving in tropical lagoons without lights or just look at coral reefs through glass-bottomed boats and why filmmakers can work without additional lighting for 10s of metres under the surface. Any warmth in the air above the water is a minor player as far as heating within the body of water goes. Of course, CO2 in the atmosphere affects how much of that accumulated energy can be radiated away. But the oceans are heated directly by radiation and that heat is distributed by both convection and a bit of conduction (though that's probably confined mostly to small bodies of water, like lagoons separated from the wider ocean and minimally affected by tides). The poor old land on the other hand is stuck with direct absorption only at the surface and whatever conduction can do through rocks. No radiation or convection at any depth. The one and only time they can legitimately use "It's the sun" and they fluff even that. I don't know what he did with his anomalies. They aren't those reported by NODC. He screwed it up somehow. He seems to have aligned them all at zero for 2003, almost. Sorry, Bob. When you try to match a line's slope, but then shift that line upward, choosing the intercept deliberately to make the prediction look as bad as possible, that's dishonest. When unconstrained by physics and reality, you can do anything you like. I don't see why all those epithets of innocence re climate revisionist Bob 'Drivel' Tisdale. The man is a thug who knows perfectly well what he is doing. He is NOT 'puzzled'. He is a deliberate liar and a thug. Then call him that. cRR, not to be too picky, but he can be both a liar and an idiot. emsnews: "Just below the surface, Water is heated by volcanic activity in the various tectonic plate divisions. So it has zero to do with CO2." 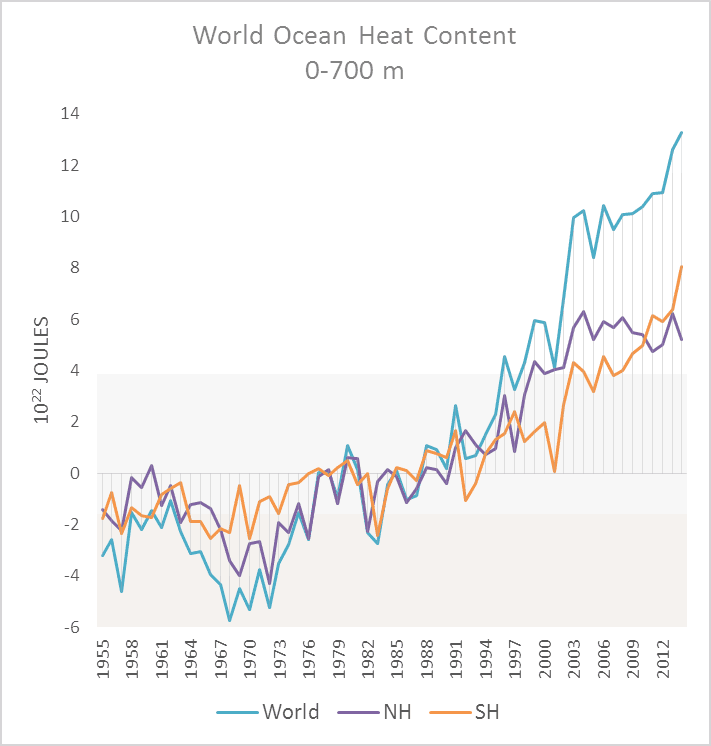 Sou: "There was no discussion of what is causing the the oceans are heating up if not for the increased IR, except for one rather silly person - emsnews who seems to think the deep cold ocean is hotter than the surface. Weird." It's even weirder than you think, Sou. Mr. News knows there is undersea volcanic activity. He's probably seen some news coverage on the array of life being found at deep sea hydrothermal vents. THAT's how ocean water is heated. Apparently atmospheric temperatures have nothing to do with it. This can be proven with a simple experiment. Notice that when you put ice in your drink at home, it never melts. There is no heat source in your drink to warm the liquid, and that's how water is heated.